Check out what's going on at the Civic Center. The Fayette Civic Center is a beautiful and spacious renovation of the old Fayette Grammar School built in 1930. The Center has the character of an older building yet furnishes the conveniences of our time and life style. It provides our community with full service capabilities for meetings, banquets, weddings, family reunions, seminars or other special events. Large Dining Room Seating capacity up to 86. Small Dining Room Seating for 20 to 30. Conference Room for small meetings up to 12. Meeting Room Seating accommodations auditorium style or seating at Conference tables. Large Auditorium Includes stage, lighting, sound, screen and projector with seating for 365. 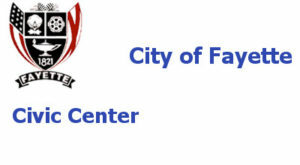 If you are interested in booking the Fayette Civic Center for your event, please call Glenda Robertson at 205-932-8727, or email Glenda Robertson at - fayetteciviccenter@watvc.com. We would appreciate the opportunity to be of service to you! We are now on Facebook. Check us out! 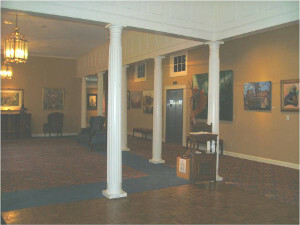 The Civic Center is home to the Fayette Art Museum, an established regional attraction displaying art by internationally known Fayette native Jimmy Lee Sudduth; Rev. 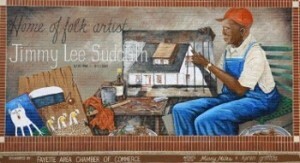 Benjamin F. Perkins; Fred Webster of Berry; Sybil Gibson of Jasper; Jessi LaVon of central Alabama; Wanda Teel of north Alabama; Moses T and Doug Odom of south Alabama; Margarette Scruggs of Walker county, and Lois Wilson and other folk and mainstream 20th-century American artists. The Civic Center is also an excellent display space for the Fayette Art Museum. More than 500 running feet of wall space is devoted to exhibiting over 500 pieces of art work from the city’s permanent collection which numbers over 4000. The Civic Center is also the home of the Fayette County Sports Hall of Fame. This organization recognizes athletes from Fayette County that have excelled in baseball, basketball, football, softball, and track. The Sports Hall of Fame also honors volunteers and coaches that have contributed to athletic programs in Fayette County. Over 100 participates have been inducted into the Sports Hall of Fame since 2003. The Sports Hall of Fame is under the direction of eight board members and is located in the downstairs area of the civic center. The Fayette Civic Center served as the Fayette Grammar School from its building in 1930 until its abandonment in 1973. Thereafter it deteriorated and became an eyesore in the community until Mayor Guthrie Smith became involved in its rescue and refurbishment as an asset to the community. A longtime dream of then Mayor Guthrie Smith of someday having a Civic Center for Fayette began to focus on this abandoned school building. Three years of talk and negotiations with the Fayette County Board of Education resulted in their deeding this property to the City of Fayette for the purpose of conversion to a civic center. Immediate steps were taken to fund the project. The City of Fayette obtained a low interest loan from the Farmers’ Home Administration, hired an architect in May 1980, appointed a planning and decorating committee, awarded a contract in September 1981, and had open house on October 17, 1982. In 1988, Mayor Smith and two citizens incorporated and established an Endowment Fund for the Fayette Civic Center. The J. Graham Brown Foundation, Earl McDonald, and the City of Fayette provided the main source of support for the Endowment. Over the years the Civic Center has hosted a great variety of events for many functions. In addition it also brought much attention to Fayette by becoming home to the Fayette Art Museum. The vision of Mayor Guthrie and others has greatly rewarded the city of Fayette through its development of the Civic Center.